A Zurich-based think tank asks: “Who is influencing the way we think today? Whose ideas are determining ours?” To answer that question, it teamed up with an MIT researcher to rank the world’s top 100 thought leaders of 2014. In a talk I recently gave at Cornell, I discussed how some thought leaders have shaped GMO perceptions and public discourse on agricultural biotechnology. As long-time readers know, I’m interested in the emergence of popular narratives and memes, everything from the Easter Island eco-cide metaphor to the climate wars and climate/conflict framing. Groups like Greenpeace and thought leaders such as Michael Pollan, Vandana Shiva, and Bill Nye have enormous clout in their respective spheres. Greenpeace is a major player on the environmental stage. Pollan has the ear of foodies, Shiva is the patron saint of socially-conscious greens, and Nye is the geeky science hero that takes on creationists. Does it muddy the science communication environment for GMOs if a big environmental group and beloved thought leaders traffic in inaccurate information? Given their reach, I think so. The most consequential decision Rolling Stone made was made at the beginning: to settle on a narrative and go in search of the story that would work just right for that narrative. An escalating fixation on perfectly drawn characters and beautiful narratives has emphasized storytelling over truth. It’s this obsession with tidy stories and uncomplicated characters that has brought us Jonah Lehrer, Mike Daisy, Tom Junod and Malcom Gladwell. The truth is rarely as poetic and neat as these writers would have us believe. To be clear, every writer makes crucial decisions in the writing — which story to tell, which details to emphasize and which to leave out. There’s no getting around this, and it’s the journalist’s job to tell a story that serves the reader, not the source. But that story must be built on truth, not the storyteller’s idealized rendition of it. Priest’s emphasis on the hegemonic role of pro-biotechnology institutions, for instance, leads to a corresponding neglect of other institutions, including environmental organizations and advocacy groups that are critical of the biotechnology industry. Priest believes that the views of such groups, when included at all in press reports, are discounted and delegitimated. Yet organized critics of agricultural biotechnology have had considerable though sporadic success shaping the vocabulary and the content of media coverage during the past two decades. While Priest undertakes a critical analysis of the rhetoric employed by industry representatives, she fails to pay similar attention to campaigns mounted by industry’s opponents. I would wager that since 2000, the anti-GMO side has been way more successful than the pro-GMO side at framing media coverage of biotechnology. To understand the missteps of the biotech industry (in terms of failing to gain broader public acceptance) and the winning strategies of GMO opponents, read Lords of the Harvest: Biotech, Big Money, and the Future of Food, by Dan Charles. It’s nearly 15 years old, but still relevant. If food safety and environmental NGOs can’t be trusted on GMOs, then what about our popular thought leaders who are viewed as eco-champions? In my Cornell talk, I referred to them as “cultural brokers” because these influential figures serve as trusted intermediaries for knowledge passed down to those with shared cultural values. Whether these cultural brokers I talk about are trustworthy sources on GMOs is for you to decide. For me, it comes down to the stories they tell (often repeatedly) and when you look closely at some of them, as I have, you may discover that they are just as bogus as that story recently retracted by Rolling Stone. But once you settle on a narrative (as we learned in the case of Rolling Stone), it’s very hard to let go. If feel that “journalists” editorializing, rather than reporting, is one of the root causes of the polarized society we have today. It’s so rare that you can read an article, or watch a news program, and get a fair representation of all the facts around the arguments. It would be nice if we could come up with some sort of pier vetting process. Writers could submit to this process, and after whatever logical requirements were met, the writer could then be a confirmed as a Journalist. Then, if the writer slips into editorializing, they could be stripped of the journalist title. Much like how we handle lawyers, doctors, etc where they need a license to practice as such, a writer should need to meet certain standards to be able to practice as a Journalist. The media has become extremely powerful, I feel controlls need to be put in place. When the 1st Amendment was written the most powerful tool was a printing press, when the 2nd ammendement was written the most powerful gun was a muzzle loader. We now have restrictions and controls on all guns since they have become much more refined and powerful. Why can’t we do the same with dangerous speech since the outlets have become much more refined and powerful? It’s a good thought to ponder. You can take note of all those influential people you can think about then I honestly believe it’s better to take your own opinion out of those influenced ones. What’s ironic here is that this notion of an “escalating fixation” is one of those “beautiful narratives” that isn’t grounded in evidence-based journalism. Is there an increasing trend of bad journalism? Were there fewer poorly researched articles published in the 1990s? The 1950s? The 1920s? Is there evidence of a trend of more emphasis on storytelling over truth? Yes, there never has been a golden age of journalism, but a case can be made for an “escalating fixation” since the rise of narrative-centric, literary journalism or New Journalism in the 1960s. As with something like autism – the fact that you can name names may well be that we’re better at uncovering and exposing poor journalism when it takes place. So make it. You haven’t done so. To make that case you need some longitudinal and quantified evidence. Otherwise, it is little more than storytelling. Your relentless sophistry always impresses. As is the speed with which you devolve into ad homs. There is no debating with a sophist. I’m always reminded of that whenever I occasionally engage with you. And I will note that in the excerpt you provided, the identification of this “escalating fixation” isn’t even speculative – it is stated as established fact. Journalism treated ethics and facts much more seriously in the past 50 years. Part of this was it was just newspapers and a few television networks that controlled much of what everyone saw. Many places still have high ethics. NYT, WP, WSJ would all be shamed by this type journalistic failure. And when similar things such as RS did happen, people did get fired. The advent of opinion journalism presented as factual journalism has hurt the credibility of journalism in total. My opinion (of course) is that environmental journalism is one of the worst offenders here. It’s gotten worse, but some people still take their job seriously. And to their credit, many of them have spoken out on the RS issue. I don’t believe NYT, WP have gotten better than they once were. It depends on the topic. In a period about 12 months ago, NYT ran 42 stories, editorials and news analysis pieces related to gun violence and control consecutively without mentioning US gun murder was down. At the time the numbers were it was down 50% since 1992, it is now down almost 60% since 1992. Since it is a known and documented fact that most people don’t know this, and a majority of persons on the left think it is up, and reporters covering it would or should know, this is some serious junk journalism on that topic. As far as Rolling Stone or equally bad garbage out of Mother Jones, the criticism by the mainline press was late and tepid. I agree with you mostly, but it is very dependent on subject matter. Politically sensitive topics get skewed. I suppose I should say they are the best sources in the MSM together, not separately. One really needs to balance the NYT with the WSJ on many topics. The NYT does do really good reporting on subjects that do not fall into the left/right culture wars. They cannot be trusted on political topics. For example they crucified Christie on Bridgegate yet pretty much gave Menendez and NY senator Silver a free pass relatively for much larger sins. There are good journalists out there who do care about their product and their profession. ==> “It’s the endless repetition of this technique that discredits it. is how resistant some folks are to owning up to it. 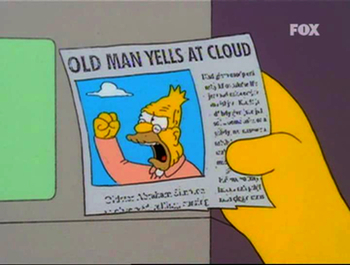 guess is that history is filled with old men yelling at clouds. claim of a trend, I challenge them to provide evidence. If you think that makes me deserving of ad homs, you’re entitled to your opinion. People don’t need to prove everything they say. Black is the color black, it is darker than white. I don’t need to attach a thesis on the electromagnetic spectrum. If you want to dispute an assumed fact, counter it. I’ve watch the media for 35 years, I agree with the assertion KK presented. I think most journalists would agree. In the end they are giving their customers what they want and that is the more interesting question of why society has apparently changed to want this. I put no stock in anything published or presented by any major media outlet. “News” in today’s world is hard to come by. Even if what is presented is balanced and factual, the “news” is biased by WHICH balanced and factual “stories” are presented. NPR runs stories on immigrant families destroyed by deportation; Fox runs stories on immigrants who are convicted criminals. I do think, though, that there is a *strong* trend toward biased reporting. IMO, it’s driven primarily by the declining profitability of – and increased competition within – the media business. As competition has increased and margins have declined media outlets are forced to maintain market share by targeting specific audiences, meaning that they then have to present stories and information that interest that audience – and stories and information that don’t offend that audience. As opposed to yesterday’s world? What is your evidence of a trend? Do you have anything other than your anecdotal observations, which are obviously subject to observer bias and confirmation bias? Remember that to establish a trend you need longitudinal data. My anecdotal observations are *absolutely* subject to bias. Nonetheless, I’m happy to accept them as fact in the absence of evidence countering them. Note, Joshua, that I also have a *hypothesis* based on basic laws of economics – that is, one employing a theoretical framework – that *explains* my observations. Joshua, if someone told you that humans have two arms and two legs you’d demand “evidence” for the claim. If the person then showed you a photo of a person with two arms and two legs you’d dismiss it because it’s not peer reviewed. If someone then showed you a peer-reviewed paper proving that people have two arms and two legs you’d claim one paper doesn’t make a consensus. it’s a wonder how a person can get up in the morning without evidence that the ground beneath his feet is solid. When people say that they see simplistic patterns in massively complex and variable social and societal interactions I ask if they have evidence for their claims. it’s well established in the scientific literature that people see these kinds of patterns in order to reinforce their own social and ideological identifications. Another common pattern is where when challenged to offer evidence in support of these supposedly obvious patterns, so obvious in fact that you don’t even need evidence to establish them, people attack the person asking for evidence. if you’d like I could show you evidence of what I’m talking about. Instead of using a debate technique of giving everyone inane homework assignments, present data to advance your own counter argument. This technique comes off as a child asking “why” to every answer a parent gives. It’s the endless repetition of this techniques that discredits it. The fact that the Rolling Stone is not even disciplining anyone, much less firing them, is what is really bad for journalism. If anything more clearly demonstrates that the narrative is more important than ethics or truth it is this (non) action. Truly deplorable. If you want to sea (ha ha) something even worse from RS, read this article on sea level rise. Go read IPCC AR5, Ch 13 and compare with what is presented here. Alternate realities. I was literally laughing out loud reading this one. Of course since this article was on the “most thought policed narrative of our time” it was not taken down by anyone. Now if we replaced Miami with Tuvalu in that article, then it might be more based in reality by century’s end. I feel bad for the people in low-lying island areas that are going to be swamped within several decades. Unfortunately many biotech companies, junk food manufacturers, NGOs, , government organizations, and popular thought leaders can’t be trusted regarding their statements on environmental impact and safety of GMOs. I am curious about Keith’s Kloors thoughts regarding the recent reclassification of Roundup as “probably causes cancer”, and how that fits into his narrative. I agree that glyphosate does not necessarily need to be banned just because it probably causes cancer. And, I also agree that we should not stop testing it for safety. My main problem with the reclassification is that it could possibly underestimate the cancer causing effect due to it only considers Glyphosate and not actual formulations of herbicide being used. I would like to see governmental and 3rd party studies done comparing toxicity, cacinogity, and environmental impact, of actual formulations of glyphosate commonly used by farmers. In the mean time, I believe it would be a good idea to regulate/restrict it’s use a bit more and possibly discontinue using Roundup Ready Corn and Soy to produce biofuels. So, in other words, you support a ban. No, I don’t support a ban. I support regulations that would restrict and reduce its use by around half of current levels, which could be accomplished simply discontinuing current corn/soy biofuel subsidies. There has been no “reclassification” of glyphosate by any regulatory agency in the world. Your comments are based upon mythology. Whether the “science” of GMO’s is valid isn’t really the problem. And all the scientists that work there are not the problem. The problem is political and economic: how a company that makes weapons-of-mass-destruction chemicals expands after their product has been banned for use in war, and us allowing it to think it can apply its technology to the food we eat as a way of expanding. There is a population of people that are dedicated to eating foods that have not been touched by synthetic pesticides, and they would like foods that have pesticide-resistant genes to be labeled. That is a reasonable request. There is a population of small-hold farmers that have been sold this technology (for that is what GMO’s are), only to realize the finances of having to buy the seeds every year because they can no longer use the seeds they grow, and continue to use ever larger amounts of expensive pesticides and fertilizers, eventually bankrupts them. That is not a sustainable strategy for neither party. The express goal of GMO’s is being able to spray pesticides in a field and kill everything except the crop. Let the violence and hubris of that premise sink in. [It has also been found that more and more pesticides are needed as time goes on.] Pesticides and over-use of fertilizer kill the soil biota upon which all soil health depends, and create Dead Zones in the oceans. Killing the soil is not sustainable, and farmers, always looking to maximize profits in an economic “game” that is stacked against them, have not been able to stop using ever increasing amounts of fertilizer and pesticides to compensate for nature’s adaptation process. That is not sustainable. But most egregious of all, once GMO’s are in open fields, their genetic material “travels,” by natural means (pollinators, wind), to nearby fields, to the soil and to the weeds, which makes any organic farmer in the area vulnerable to losing their crop and their organic certification, ie., their way of life and their business. And to add injury to insult, because the US has allowed these companies to patent their technology (seeds), the corporations can and do take small farmers to court when their crops contaminate the farmer’s fields, assuring bankruptcy for something the farmer had no control over, and did not want. And that is fascism taken to an extreme, and these are the real problems GMO manufacturers have. Monica, you seem to love to dream up theoretical “populations” that don’t really exist. I gather from reading your post that you really don’t know much at all about biology, or about agriculture. Or economics and business. Or about the workings of governmental agencies. Sorry that you haven’t been grounded in reality, but once you do obtain that grounding, please come back & chat with the rest of us. We’ll hope to hear from you in about a decade or two. “Theoretical” populations? Organic farmers are not a theoretical population, especially not the over 220,000 of them that launched a class-action lawsuit against Monsanto in 2011. And please don’t tell me that they lost, and therefore don’t count; they “had no standing” because Monsanto has stopped taking farmers to court who have “inadvertently” grown their GMO seed crops, as a strategy for avoiding more lawsuits. That is a matter of patent law, not one of whether patenting living organisms should be allowed (a debate still going on today, as EU courts have decided against allowing patents on live organisms). It just means patent law was the wrong forum to fight against Monsanto. That does not mean that the damage that Monsanto’s product inflicts on organic farmers and their crops and their livelihoods does not happen. Farmers lose their organic certification if after inspection GMO plants are found to be present in their fields, and that causes them to lose their livelihood. And if they want to be proactive, they stop growing whatever GMO crop is growing upwind from them. Unfortunately, organic agriculture demands crop diversity, and the more crops are genetically modified, the less diversity organic farmers have access to, which again, makes them lose their livelihood. So they have a point. There is a population of people that buy organically-grown foods, as witnessed by the growth of Trader Joe’s, Sprouts Farmer’s Markets, Big Bear Natural Foods, Fairway Markets, Wild Oats Marketplace, Whole Foods Markets, Good Harvest Markets, Bi-Rite Markets, Local Foods, Kimberton Whole Foods, and LifeSource Natural Foods, so that’s not a theoretical population. Seeing the difference that exists between organically grown food and industrial and GMO crops, organic consumers and organic food providers have asked that GMO foods be labelled, something which the biotech industry has actively fought for decades, citing that their products are food, just like any other, and labelling them will be detrimental to sales. If the industry had labelled them correctly from the beginning, instead of fighting such important stakeholders as fellow farmers, farmer’s markets, supermarkets, and consumers, things might have been different. But they chose to weild their considerable power in a less than caring manner, so we are where we are. That does not mean that organic consumers don’t have a point, and a right, which are both being ignored, and they are being harmed because of that disregard. See how I responded to you with a couple of really good examples, all grounded in very real reality? I don’t know where you think you can say I know nothing about business, economy, biology, agriculture, or government workings. You don’t know me, so you can’t have a clue as to what I know or don’t know. But I’ll tell you one thing, saying I know nothing is not an argument against the points I made above. A personal attack does not obviate valid arguments; it just shows you don’t know how to have an intelligent conversation. So when you learn to have civil discourse with other people, and listen to what their concerns are, and can stop yourself from automatically labelling them as ignorant to cut short the argument, then we can continue this dialogue. Before then, it’s just a waste of my time.